Incredible videos taken within dangerously close proximity to violent tornadoes are now captured every year. In 2013, the devastating Moore tornado was filmed from two vantage points as it thundered past the Odem residence near Plaza Towers Elementary. □ Video is one of the best mediums for studying the complex nature of tornadic winds. Due to the availability of inexpensive cameras and the proliferation of smart phones, an increasing number of tornadoes are being documented first-hand each year. From a research perspective, such footage is important for two reasons. Firstly, the various videos provide further evidence that suction vortices and small-scale wind features are responsible for the erratic and extreme nature of tornado damage. Additionally, video documentation indicates that the Enhanced Fujita Scale underestimates the intensity of winds in violent tornadoes. The Tupelo tornado was captured by an exterior surveillance camera at Saint Luke United Methodist Church. □ On April 28th, 2014, tornadic activity associated with a deadly two-day outbreak took aim on northern Mississippi. At 2:42pm, a multi-vortex tornado touched down near the Lee County border. The tornado slowly intensified and grew in size as it raced to the northeast at 50mph. Just before 2:50pm, the tornado entered the northern fringes of Tupelo. Damage was of EF1 and EF2 intensity until the tornado reached Clayton Avenue, at which point the storm rapidly intensified and destroyed three adjacent homes, one of which was swept completely away (NWS, 2014). The tornado then tore through a wealthy neighborhood just south of Legion Lake, unroofing and partially destroying several mansions. Winds were near peak intensity as the tornado ripped through a commercial district at the intersection of Gloster Street and Green Street. More than a dozen large businesses were within the tornado’s path, including a four-story Sleep Inn that lost its top floor. Across the street from the motel, a large bingo hall was nearly leveled. The tornado continued to the northeast for an additional 20 miles before dissipating. Overall, the tornado caused 40 injuries and one fatality (NWS, 2014). A surveillance camera near McCullough Boulevard captured the tornado as it passed over a church playground. The church complex is located on the north side of Clayton Avenue, across the street from the initial streak of EF3 damage. As the tornado approached the area, the sky darkened considerably and the camera switched to a low light mode. Vehicles are visible driving on Country Club Road even as northeasterly inflow winds surpass 100mph and trees begin to snap in unison. Due to the tornado’s multi-vortex nature, winds within the core of the storm were highly variable. The most intense winds occurred on the backside of the tornado and were from a southerly direction. The church building acted as a barrier to the strongest winds, resulting in only modest damage to the playground equipment. Damage to the church was consistent with an EF1 rating, in sharp contrast to the destruction only a short distance away. In the late spring of 2012, a man filmed an unusually persistent waterspout as it tore through a residential area in Grande Isle, Louisiana. □ More than a thousand waterspouts are spawned each year along the Gulf Coast. Unlike terrestrial tornadoes, most waterspouts are formed from garden variety thunderstorms and pack winds under 100mph. Since they are generally weak and fueled by warm water, waterspouts usually dissipate rapidly once they make landfall. On some occasions, however, they retain their strength over land and pose a threat to life and property. In May of 2012, a series of waterspouts formed over Caminada Bay in Louisiana. The largest waterspout travelled in a southeasterly direction towards a residential area on Grande Isle. The narrow funnel came ashore over a marshy area and continued inland without weakening. As surprised residents took cover, the tornado swept over homes on Raspberry Lane, destroying one residence and damaging seven nearby homes (Examiner, 2012). The tornado traversed the quarter mile width of the island and entered the Gulf of Mexico, where it quickly became diffuse and dissipated. A Grande Isle resident captured the waterspout from a home on Raspberry Lane. The videographer initially documented two waterspouts as they swirled over the bay and slowly edged towards northern coast of the island. As the larger waterspout approaches shore, a man exclaims “that’s the biggest I ever seen.” The filmmaker took cover beneath a balcony as the tornado continued its slow approach towards a cluster of homes. When the tornado strikes, winds of approximately 90mph are visible swirling around the tiny core updraft, which was only 40ft wide at the surface. As the core passes over a house on stilts, it rips away the roof and a poorly attached section of the off-ground structure. The damage was later awarded an EF1 rating. A cellphone camera captured the 2013 Milan tornado as it swept through an industrial district northeast of Milan. In May of 2014, another incredible, up-close video was taken of a small but strong tornado near the city of Modena. □ More than 400 tornadoes touchdown in Europe each year, the majority of which are of F0 or F1 intensity. Northern Italy is perhaps the most severe weather prone region on the continent and one of the few places outside the US where violent tornadoes form on a regular basis. One of the most photographed tornadoes in Italian history touched down in the northeastern suburbs of Milan on July 29, 2013. The large funnel, the third to strike the city in a three month period, was spawned from a powerful supercell thunderstorm with large hail and hurricane force winds. The tornado strengthened to F2 intensity as it swept through industrial parks in Grezzago and Trezzo, filling the air with a blizzard of debris. Most of the damage occurred in Grezzago, where the storm ripped roofs off warehouses and rolled vehicles into piles. In total, the tornado displaced 12 families and caused several injuries, including one pedestrian who was crushed by a rolled vehicle (Autunno, 2013). 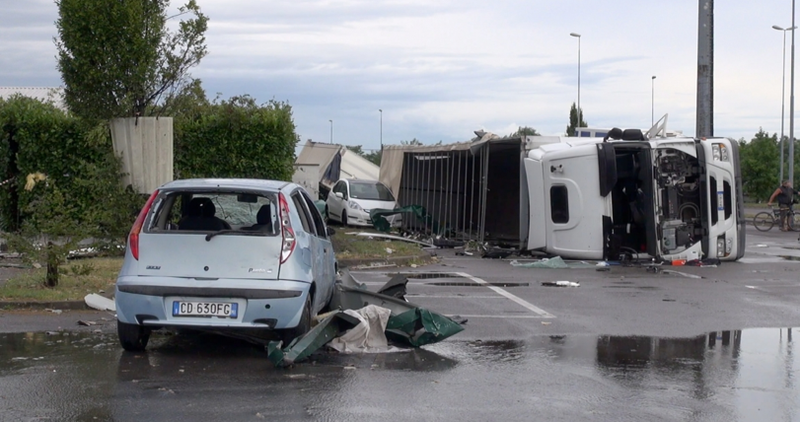 The Grezzago tornado flipped dozens of lorries near a DHN transport center. An office worker captured the storm with a cellphone as it tore through the industrial section of Grezzago. The footage begins soon after the tornado passed over the A4 Freeway and damaged a Geodis transport center. A thick cloud of roofing materials from nearby warehouses filled the air as the tornado slowly swirled towards the filmmaker. The primary funnel was less than 100 yards wide but imposing in appearance due to the vast quantity of light weight debris ingested from a DHN trucking depot a block away. The footage ends abruptly as the winds change direction and threaten to break windows near the videographer. Gui Teixeira captured rare video of a tornado as it swept through a coastal area in southern Portugal. □ In the fall of 2012, a supercell thunderstorm developed off the coast of southern Portugal. The powerful storm-cell spawned a large waterspout several miles south of Lagos, a densely populated resort community in Portugal’s Algarves region. The tornadic waterspout came ashore in the town of Carvoeiro, damaging beachfront condominiums. The tornado continued northward into a mountainous region, eventually reaching the town of Silves seven miles inland. The tornado passed over a soccer stadium and swept through the center of town, ripping tiled roofs off multi-story apartment buildings and flipping dozens of vehicles. Most of the 13 injuries occurred in overturned cars, some of which were rolled more than 50ft (SkyNews, 2012). One woman died of her injuries a month after the tornado. Portugal’s Met Office deemed the tornado to be “moderately devastating,” and available imagery indicates the tornado left damage of EF2 intensity (Bratley, 2013). 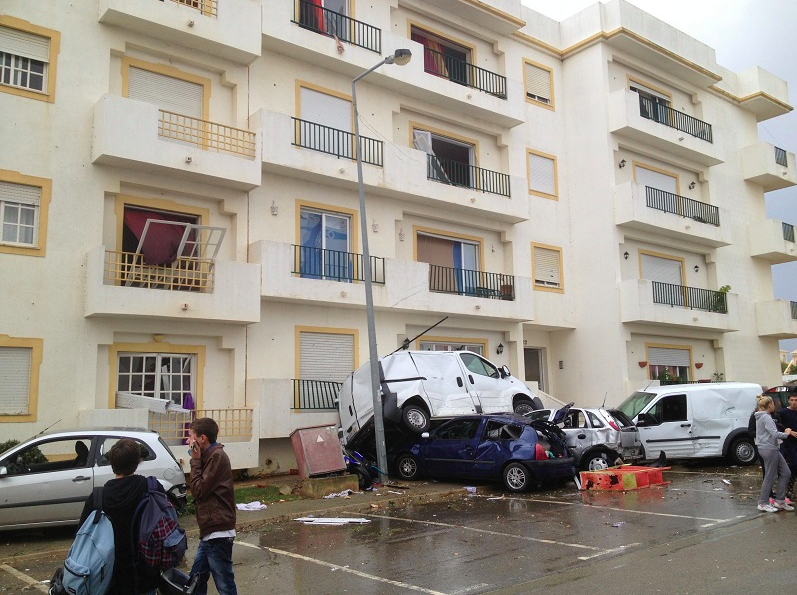 Vehicles piled beneath a damaged apartment building in Silves. Photographer Gui Teixeira captured the tornado as it passed directly over the Dr. Francisco Vieira Soccer Stadium in Silves. Teixeira first captured the tornado as it descended a hill and crossed the Arade River at the southern edge of town. The footage shows inflow winds ripping the canopy off the stadium’s bleachers moments before the 300-yard wide funnel engulfs the field. As the core of the storm passed over the videographer, perimeter fencing was swept away and roofing debris tumbled through the air. Rough analysis of the footage and subsequent damage indicates that the tornado was likely at marginal F2 intensity in the vicinity of the stadium. A surveillance camera at Pete’s Shell gas station captured the complete destruction of a poorly anchored home in Diamond, Illinois. □ In the midst of a devastating tornado outbreak on November 17, 2013, a fast-moving tornado touched down 40 miles southeast of Chicago. Unlike other tornadoes that day, the storm never developed a “wedge” appearance but instead appeared as a hanging funnel above a transparent debris cloud. The tornado skirted between two large towns and swept through a neighborhood in Diamond, a tiny community along Interstate 55. More than 75 buildings suffered “major damage” and at least one home was completely destroyed (“Diamond continues…”, 2013). Surveyors later determined that the storm left damage of EF2 intensity. A north-facing surveillance camera at a Diamond gas station captured the fast-moving tornado as it passed just east of town. The footage depicts an area of extreme winds obliterating a two-story home on Johnson Road – across the street from a largely undisturbed gas station awning. When the footage is analyzed in detail, the complete destruction of the home appears to have occurred just after the storm’s core passed a short distance behind the property, as evidenced by the west-to-east debris flow. The footage indicates the home was dislodged completely from its foundation prior to being destroyed, an indication of poor anchoring. From a human perspective, the footage reveals how deadly even modest tornadoes can be in unreinforced, wood-framed buildings. A surveillance camera captured a fast-moving, multi-vortex tornado as it passed over a hospital complex in West Liberty, Kentucky. The EF3 tornado was spawned from an exceptionally well-structured mesocyclone that failed to produce a condensation funnel. □ On March 2, 2012, a series of violent and fast-moving tornadoes swept through the Ohio River Valley, causing 41 fatalities. One of the most notable tornadoes during the outbreak left an 86-mile swath of destruction through eastern Kentucky and West Virginia. The tornado touched down in the hills of central Menifee County and roared eastward with a forward speed in excess of 60mph (NWS, 2012). Two people were killed before the tornado entered Morgan County, where the damage swath was consistently one mile in width. After traveling 20 miles in 19 minutes, the tornado ripped through downtown West Liberty, causing six additional fatalities (NWS, 2012). More than a dozen multi-story brick buildings were destroyed in the town’s center, and over 100 homes were unroofed or partially leveled. The tornado had the longest path-length of any single storm during the outbreak and caused 10 fatalities during its 80 minute lifecycle. A surveillance camera at Clinic Pharmacy in West Liberty captured fascinating footage of the tornado seconds before it entered the town’s central business district. The footage sheds light on the tornado’s highly complex wind-field, which was in excess of a mile wide but highly erratic due to transient suction vortices. 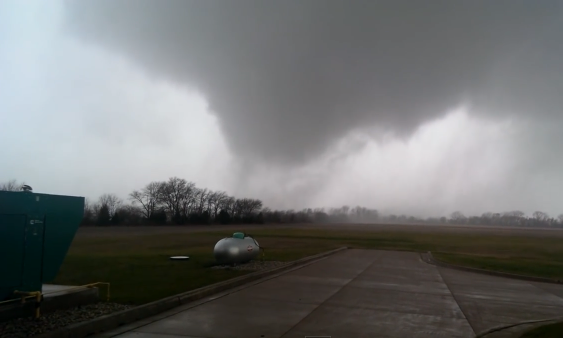 Unlike most violent tornadoes, the storm lacked a solid condensation funnel. In the first half of the footage, the winds have a strong vertical element – lifting a portion of the medical building’s roof straight upward. The lack of horizontal momentum may be due to the tornado’s rapid forward motion, which both amplified and cancelled rotational velocities in varying parts of the storm. As the core of the tornado moves to the east, an extreme blast of westerly winds causes the majority of the damage in the area. Surveyors later determined that the tornado caused EF3 damage near the medical complex and immediately to the east in downtown West Liberty. A quarter mile west of Clinic Pharmacy, a home surveillance system captured incredible footage inside the deadly tornado. The residence, located on Dixie Lane, experienced modest damage but was within close proximity to a swath of EF3 damage. A surveillance camera at Henryville Middle School captured the onset of a deadly tornado on March 2, 2012. □ On the same day as the West Liberty tornado, an even deadlier storm sliced through the town of Henryville, Indiana. Similar to other violent tornadoes during the outbreak, the Henryville tornado travelled almost due east at speeds in excess of 60mph. The tornado first touched down in Washington County and quickly reached EF4 intensity near the town of New Pekin, where a large, well-built factory was reduced to a bare concrete slab (NWS, 2011). Nearby, thick sections of pavement were scoured from State Road 135 and three-story homes were completely leveled. Just east of the US 60, a young couple and their three children were killed in a mobile home that was obliterated. The tornado’s forward speed accelerated to 70mph in Clark County, where the most intense damage occurred (NWS, 2011). Just before 3:20pm, the tornado ripped through the northern section of Henryville, sweeping away homes and devastating the local public school. One man was killed in a frame-home in Henryville, where the primary damage swath was approximately 200 yards wide. Overall, the long-lived tornado killed 11 people along a 49-mile path that traversed two states. 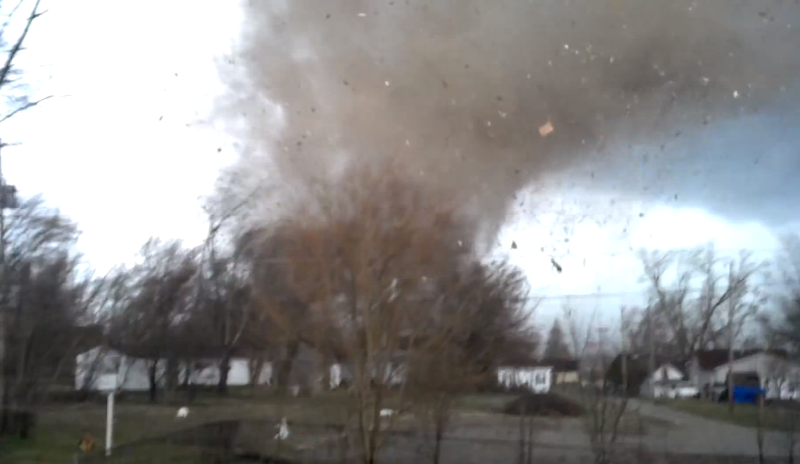 Surveillance cameras at Henryville Public School captured the tornado from multiple vantage points. One camera recorded the storm from an east-facing wall at the middle school, where the most severe damage occurred. The footage shows children exiting a school bus and seeking shelter in the school less than three minutes before the tornado strikes. Due to the tornado’s rapid forward speed, ground level winds increased rapidly and shifted direction in only a few seconds. Just before being destroyed, the camera captured a school bus and two other vehicles being pushed sideways by the southerly flow. Another camera approximately 80 yards to the north captured what appears to be the calm “eye” of the tornado, an indication the storm’s center passed directly over the school. While the majority of the school complex was severely damaged but left intact, the middle school was nearly leveled. The variations in damage are likely due to storm’s 65mph forward speed, which amplified the winds in the southern portion of the tornado’s inner core. In May of 2013, the TIV2 became the first armored chase vehicle to sustain a direct hit from a strong tornado. □ On May 27, 2013, a large tornado touched down near the town of Lebanon in northern Kansas. The slow-moving tornado expanded to over a half-mile in width as it meandered to the east-southeast through sparsely populated farmland. A homestead three miles north of Lebanon was impacted by the tornado, leading to one injury. The home’s second floor was sheared off and trees across the property were uprooted or snapped in half (NWS, 2013). Several other homes experienced mild to moderate damage before the tornado dissipated. 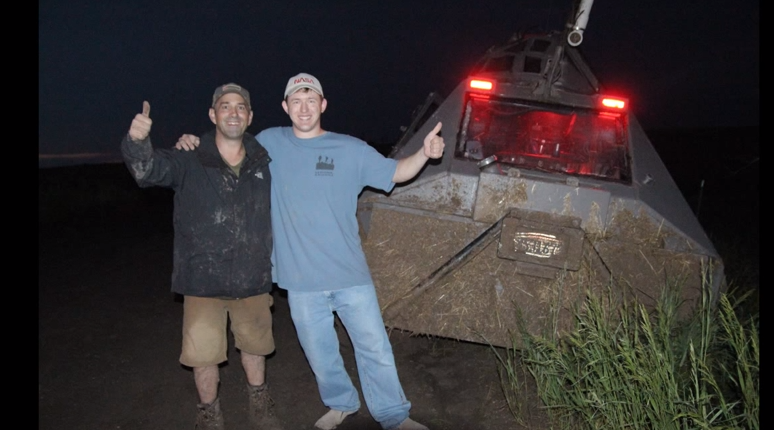 The Tornado Intercept Vehicle II (TIV2), driven by meteorologist Brandon Ivey, directly encountered the tornado on a rural county road. The 6.5 tonne vehicle parked just east of the rain-wrapped storm and deployed anchoring spikes a few minutes before the tornado struck. Video footage reveals that damaging inflow winds in excess of 100mph buffeted the vehicle before visibility dropped to only a few feet within the core of the storm. Due to the tornado’s slow movement, peak winds lasted for nearly two minutes. At one point, southerly winds sent a blizzard of hay over the vehicle. The chasers later reported that debris from a home several hundred yards away impacted the vehicle at extreme speeds and breeched the passenger compartment in two places. An anemometer atop the vehicle, which failed near the beginning of the tornado, recorded winds between 150mph and 175mph. Had the anemometer withstood the duration of the storm, it is likely winds in excess of 200mph would have been recorded. The winds captured by the TIV2 were likely congruent with the winds in other large tornadoes in the absence of suction vortices, which are usually responsible for damage above the EF3 threshold. According to past survey reports, long duration winds of EF4 intensity (166 – 200mph) are capable of causing EF5 damage, yet the vegetation around the TIV2 was largely unaffected by the bombardment of winds in excess of 175mph. Taking this into account, it is likely that ground scouring in violent tornadoes occurs due to winds significantly stronger than those encountered by the TIV2 crew. The Parkersburg tornado passed over a First State Bank branch on Highway 14 while at EF5 intensity. An outdoor camera recorded clear footage of the storm as it engulfed a frame-home. The reinforced bank building, which likely experienced winds of EF4 intensity, was severely damaged but left standing. □ On May 25, 2008, one of the most violent tornadoes in modern history touched down five miles west of the small town of Parkersburg, Iowa. The historic storm rapidly intensified as it thundered eastward at 40mph, leveling corn crop and destroying more than a dozen out-lying farm buildings. As the massive funnel approached the edge of Parkersburg, it reached EF5 intensity – only the second storm to do so in the preceding nine years. At 5pm, the nearly half-mile wide tornado swept through the southern half of town, completely obliterating 200 homes and businesses. According to the town’s mayor, most of the seven fatalities in Parkersburg occurred in basements. The tornado maintained EF5 intensity for more than 15 minutes, causing two additional fatalities in homes that were swept completely away near New Hartford. A survey team later concluded that the exceptionally powerful tornado swept away more than a dozen well-anchored homes (NWS Survey, 2008). At 4:58pm, an ATM surveillance camera at First State Bank was recording a cloudy sky with light winds. Just after 4:59pm, the air momentarily fell still. Seconds later, powerful inflow winds began buffeting trees around a frame-home on Russell Circle. The rapidly accelerating winds surpassed hurricane-force in less than six seconds, filling the air with lethal projectiles. Ignited by exploding transmission towers, the sturdy camera captured the failure sequence of the home as the dark debris cloud engulfed the area. Remarkably, a man and his young son survived inside the home, which was reduced to its baseboards. The winds captured near the end of the video are likely in excess of 200mph – the strongest ever clearly captured on film. The home incurred EF3 damage before being obscured, an indication significantly stronger winds were responsible for the streaks of EF4 and EF5 damage. An outdoor surveillance camera in the town of Tushka, Oklahoma, captured one of the most compelling weather videos ever taken. A couple and their children failed to find shelter and were caught in the storm outside. □ In mid-April of 2011, one of the deadliest tornado outbreaks in recent history left a wide trail of destruction from Oklahoma to the Atlantic Ocean. The outbreak was later superseded by two catastrophic events that left more than 500 people dead, but it remains the 6th deadliest tornado outbreak of the 21st century. On the first day of the outbreak, a large tornado touched down five miles southwest of the tiny town of Tushka, Oklahoma (NWS, 2011). Storm chasers captured the multi-vortex tornado as it expanded to over a half-mile in width and roared to the northeast at 35mph. 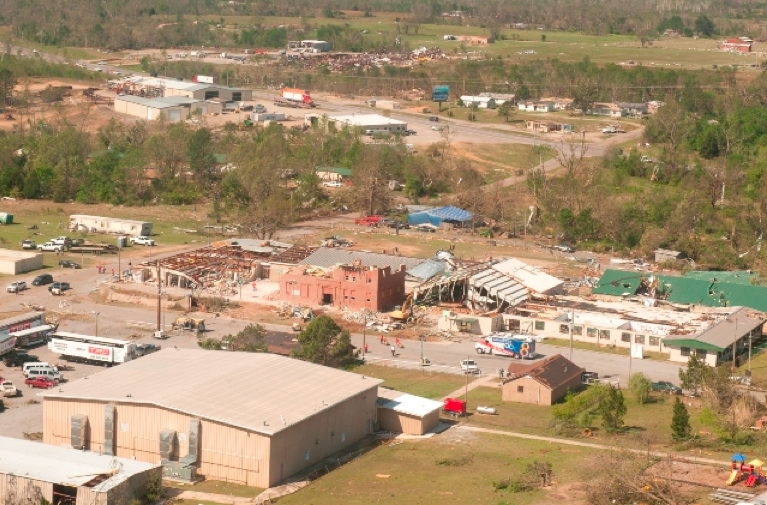 Approximately eight minutes after forming, the tornado engulfed all of Tushka, causing two fatalities (NWS, 2011). The tornado left a highly variable damage swath – small streaks of destruction were surrounded on all sides by fairly mild damage. As the edge of the tornado reached town, the four members of the Miller family were frantically driving to a storm shelter at Tushka Public School, where half the town’s population had sought shelter (FEMA, 2011). Hurricane-force winds buffeted the center of town as the family parked their vehicle in the school’s parking lot. Mrs. Miller, with her 5-year old son, and Mr. Miller, holding the couple’s infant daughter, ran to the school entrance, only to find the doors locked. Mrs. Miller later told a reporter, “the winds were so high we were getting blown backwards – so my husband walked one way and I walked another” (Shanahan, 2011). 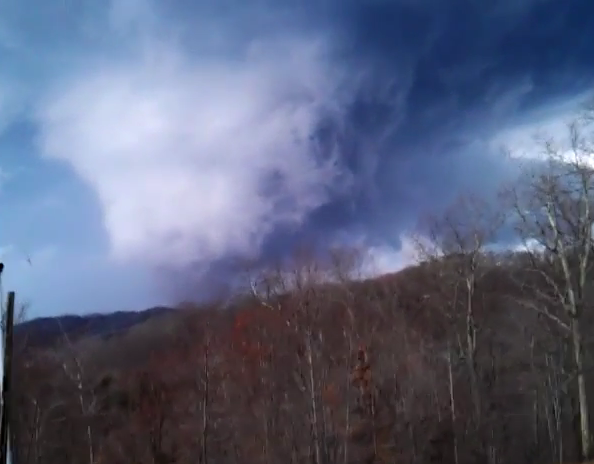 A sub vortex within the tornado reached the family at 5:12 in the video clip, causing bursts of violent winds from varying directions. Moments later, winds in the storm weakened, allowing the couple a brief opportunity to come together and kneel against a metal fence. At 5:42, a more powerful wind feature engulfed the center of Tushka. The Miller’s red SUV was pushed to within inches of the terrified family but also served as a barrier against deadly projectiles. In the background, the municipal hall and adjacent businesses were destroyed within a five second period. Less than 30 seconds later, the winds died down as the tornado exited town and continued to the northeast. The Miller family survived the storm with only minor injuries. The surveillance footage and aerial damage imagery indicate that the tornado’s complex multiple vortex structure spared the public school but directly impacted buildings on the other side of Pecan Street. Very cool, thank you for taking the time to put this together. I especially like the West Liberty videos, it’s incredible how the winds vary second by second. Surprised you didn’t include the video from the apartment complex of the 2011 Tuscaloosa EF4. 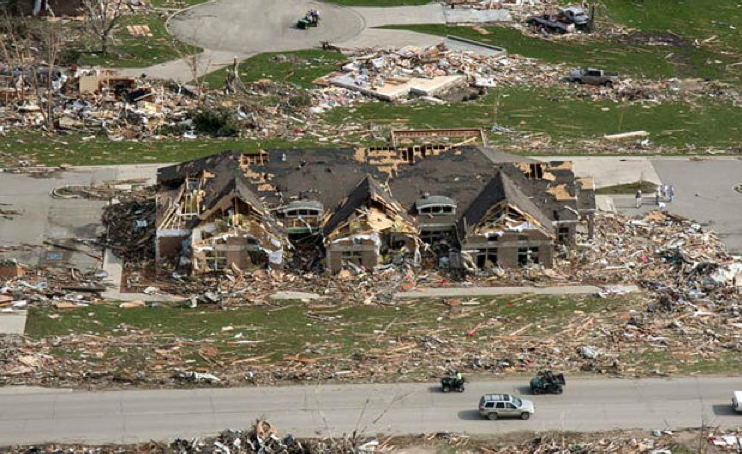 Also I read somewhere that the footage of the Diamond, IL tornado footage across from the gas station was actually a model home which is why it wasn’t anchored down. Where are you, Max? Missing your insight on recent tornado events. Vilonia, Pilger ’14, Rochelle ’15? Andy – I’m still around, I just haven’t given myself the time to write a new entry. I have a few half completed entires I’d love to finish sometime soon. I still communicate with people through e-mail and am acquiring new info and pictures. Sometime this year I’ll post again. Hey what’s the matter man? You haven’t posted anything in 3 years. I miss your posts and your content. I’m still around. I’ve partially been focused on a very different website the past year, plus finishing school and entering the working world kinda drained my time. I still pay to keep the domain annually, and I have dozens of half-baked articles. I promise I haven’t posted my last yet – I just need a spark and some time. I miss your posts, man. Maybe one on the Vilonia 2014 tornado? Pretty crazy automobile damage. Cheers. ..or the Rochelle, IL one, which was very near my hometown. Hey max here’s a little info about the Greensburg tornado, the velocities measured a reading of 230 knots which in mph is between 264 and 265 mph near a field right next to town. The tornado reportedly scoured the field right before it entered Greensburg and caused EF5 damage to the first homes it hit by the field and velocity reading. Also trees near the homes where completely debarked and cars where mangled and thrown over 100 yards. There’s pretty extensive aerial and ground imagery of the damage in Greensburg that I have checked out. It was definitely an intense tornado that caused extreme damage in parts of Greensburg and a grove of trees near a pond just outside town (and surely huge swaths in rural areas). I just didn’t think it was quite as notable as the others on the list, compounded by its huge size and slow movement. Thanks, I know that Greensburg was quite strong but definitely not as strong as the tornadoes you’ve mentioned in your list. Hey awesome site. Have been reading it for a long time. Question: what tornado do you think had the widest swath of e/f5 damage? Thanks. It’s hard to say which tornado caused the widest swath of EF5 damage, but my best guess would be the 1997 Jarrell tornado due to the half-mile wide swath of extreme scouring and empty foundations. 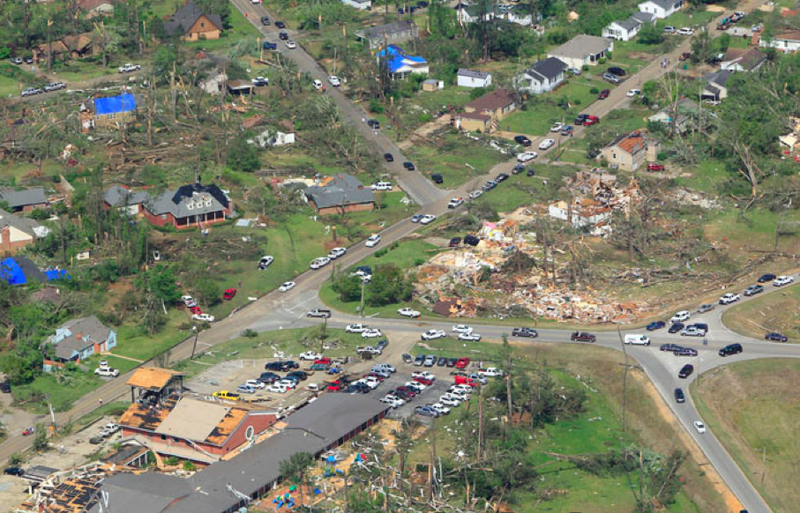 Other large EF5s like the Phil Campbell tornado in 2011 caused a streak of extreme damage surrounded by a wide swath of strong to light damage. Or really, I should say the largest swath of e/f5 winds. When are you going to post! I really enjoy reading your detailed analysis for every storm and I really want more but it’s been 4 years! I’m still around. Work gets crazy after college – I shifted to a totally different blog (not about weather) for a year. I will one day post again – I have a dozen mostly completed posts sitting around waiting to be finished.